Design your own iPod Touch 5G hard case. Your unique design printed straight on the case. Choose your favourite photo or image. This black item will be ready to ship in 2 business day(s). When you invest in a device there is nothing more frustrating than damaging it with scratches, water or dropping it. 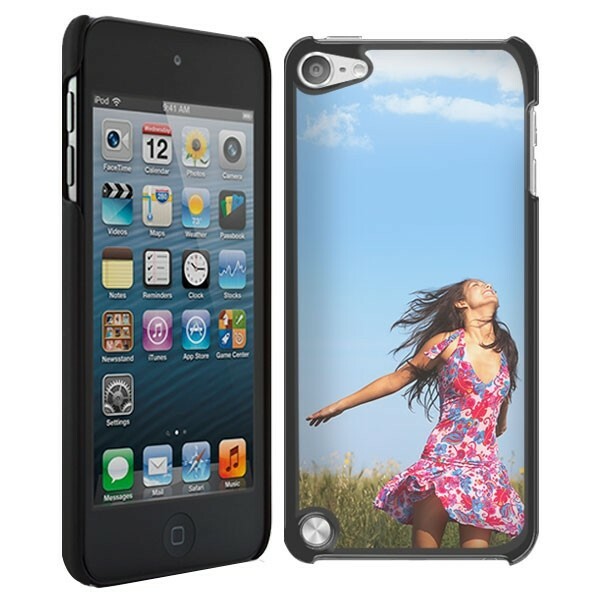 GoCustomized understand the importance of protection your iPod touch in the most appealing and usable way possible. The case has been specifically made for your iPod which ensures that all the buttons and plugholes for your charger and earphones are still easily accessible. Everybody likes to be different, so what better way than designing your unique case? How is my case made? The best thing about GoCustomized cases is that you can design the case yourself in the design program. You can do whatever you wish to achieve the desired result. Uploading images straight from Facebook, Instagram or straight from your hard drive makes it super fast. You can quickly manage the size of the image, add a text or a logo and change the colour. To deliver you the best quality we can give, it is important that the image you upload is also sharp. At GoCustomized we find it extremely important that we give you the best case we can make. To achieve this, all are cases are made piece by piece, the back of the case then gets printed with special ink. The sides of the case remain the original colour, either black or white.